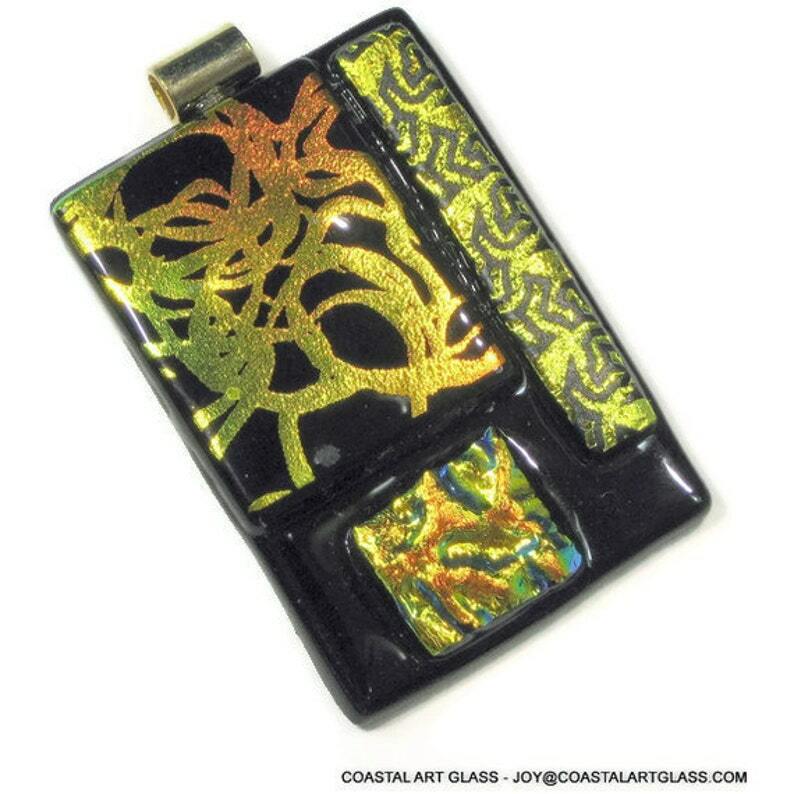 Art glass pendant necklace black gold with orange dichroic glass flames. This is a bright, elaborate fashion statement art pendant. There are three separate designs with three different textures. The gold and orange dichroic glass just glitters. What a special pendant. The bail is a gold plated barrel. This pendant measures 2" h x 1 6/8"w not including the bail. All Pendants come with a FREE 18" black wire necklace with steel clasp which screws into place easily and remains secure. This allows you to wear this piece upon arrival, but you can place it on your existing necklaces. Our Jewelry is one of a kind. The descriptions are what I see and feel as the artist. No photographs can completely capture the brilliance of the dichroic glass which changes colors and appearance in differing light. Enjoy wearing my jewelry. Big, bold and dramatic with many a customer reporting getting noticed every time they wear one. Own a small piece of art created by Joy.